The frustrating thing with The Jungle Book is how much it teases the audience into being an excellent film instead of the good but underwhelming flick it ends up being. It is more often than not a visually stunning, engaging romp featuring a rather good child actor and some excellent voice work from its cast. And yet the problems arrive with a bang, a result of some dreadful decisions coupled with plotting issues that bog down the final act. Yet another adaptation of Kipling's eponymous story collection, The Jungle Book centers on the adventures of feral child Mowgli (Neel Seethi), the so-called man-cub who lives a simple life with his family of wolves — including den mother Raksha (Lupita Nyong'o) and pack leader Akela (Giancarlo Esposito) — and is watched over by wise panther Bagheera (Ben Kingsley). At least, that is, until the day when vicious tiger Shere Khan (Idris Elba) proclaims his intent to murder the boy, forcing Mowgli to flee along with Bagheera to a human village. Their plans go awry due to tiger-related shenanigans, and poor Mowgli is left alone to fend for himself in unknown territory, surrounded by hypnotic python Kaa (Scarlett Johansson) and little creatures that steal his food. Fortunately, he meets lazy bear Baloo (Bill Murray), who teaches the boy to embrace his human side and adopt a more carefree life. Baloo's teachings put Mowgli in a bit of a moral quandary, and it only gets more complicated once he runs into the sizable King Louie (Christopher Walken) and has to face down Shere Khan one last time. The Jungle Book opens with a bang as young Mowgli scampers toward the viewer, escaping some momentarily unseen entity chasing him through the dangerous jungle. It's a terrific start to the film, hinting at Mowgli's ingenuity and cleverness while showing how he's both embraced and shunned a bit from his adopted family. The film at its best has a lot of these little details, including a running point in which Mowgli picks up a scar or two during every little adventure. It's a nice touch of verisimilitude for a movie that is fantastic by nature and by effect. The film remains quite charming to a point, which comes out of the blue when Baloo starts singing The Bare Necessities from the animated film. It’s a distracting moment that unleashes a floodgate of callbacks, lowlighted by a Walken performance of the very racist I Wanna Be Like You. That first moment with Baloo singing to himself unleashes a flood of flaws that dampen the viewing experience. The songs hinder the narrative flow, creating a rather rushed third act that also drains much of the film’s dramatic agency, a problem capped by a weak, puzzling and ultimately lazy finale. 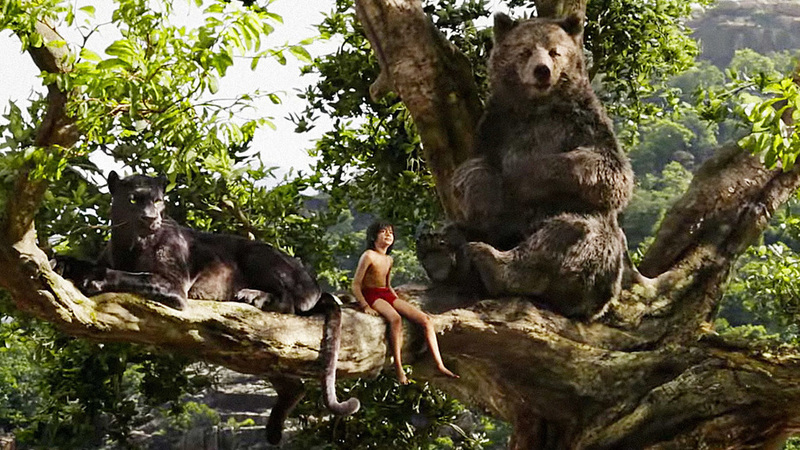 There’s also the insertion of a secondary revenge motivation involving Mowgli’s father, which highlights The Jungle Book’s major problem; writer Justin Marks’ disorganized script. And yet the whole of The Jungle Book is just good enough to outweigh the weaker parts and is helped along greatly by Seethi, who performs more like a child then an actor, especially given that he acts alongside CGI creatures in a fake jungle. Not to mention, the voice actors inhabiting those ersatz creatures are first rate. Elba is perfectly cruel and blasé as Khan, while Johansson plays a major part in providing what is the film’s best sequence; she has a knack for controlling her voice in a manner both alluring, sweet and subtly terrifying. Even Murray seems to be having a little fun as Baloo. Considering how much goes right with it, it’s still difficult not to consider the film at least something of a letdown, though. Its flashes of brilliance — even the problematic third act has one really terrific visual moment — are enough to dream of what could have been for director Jon Favreau. Perhaps he and Marks were forced to shoehorn in the music numbers (although it wouldn’t explain why one song returns as an orchestral during a chase sequence) and add in the silly Star Wars inspired subplot, making for a more inspired film than what’s left. All that’s left to analyze though is what Favreau and company ultimately delivered; a very good but flawed film that comes very close to being exceptional.